_ _ Most of my generation has become completely and thoroughly digitally-obsessed. Facebook, Twitter and even the now outdated Myspace have taken away our ability to communicate with each other without the protective barrier of a computer screen… And not to rant (but I’m going to), the self-absorption involved with social media is mind blowing! It’s not as if this has never been said, but to honestly believe that your 1,250 “friends” will be interested in the fact that “Doug is wishing he was at the beach” is beyond narcissistic. Doug, we all wish we were at the beach. Thank goodness I have this blog, where I know EVERYONE cares what I have to say… Wah waaaah. Oh the harsh mirror of a reality check. _ _ If you can pull yourself away from the fascinating updates of a constantly changing newsfeed, head to the kitchen and throw together these apple-cheesecake bars. You can even make that your status and see how many people “like” it. 1. In a blender or food processor, add all of the ingredients for the crust and pulse until the butter, sugar and flour are combined and crumbly. Press it into a 9″x13″ pan and then use the bottom of a glass to make it flat and even. Bake for 15 minutes. The crust will get all bubbly and funky looking but don’t stress, it’s fine. 2. While the crust is baking, in a large mixing bowl, make the cheesecake filling. With a hand mixer, combine the cream cheese and 1/2 cup white sugar until smooth. Stir in the vanilla and then add the eggs one at a time, beating the mixture for about 15 seconds after each. When the crust is out of the oven, pour the cream cheese mixture over it and spread it evenly with a spatula. 3. In a small mixing bowl, add the apple chunks and sprinkle the sugar and cinnamon over top and stir to make sure they’re all evenly coated. Press the apples into the cheesecake filling, totally covering the top. 4. In another bowl, combine the dry ingredients for the strudel topping and drizzle them with melted butter, using a fork to stir together into pea-sized crumbles. Spread the strudel over the top of the apples and return the whole pan to the oven and bake for another 25 minutes on 350° and then turn the oven down to 300° for another 5 minutes. 5. Allow to cool to room temperature and then refrigerate until cold. 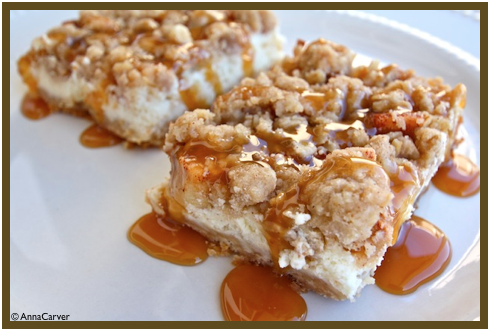 Cut into bars and drizzle with caramel before serving.